Thermal carafes are the best way to keep your coffee well and truly hot for more than an hour or two. We spent 4 days testing out the capacities and heat retention rates of more than 15 different models in order to narrow our shortlist down to these top 5 picks. Overall, we’re confident in recommending the 102 Oz Cresimo Airpot as the best thermal coffee carafe for most situations. I don’t have to tell you how important a good cup of coffee is for most people nowadays. Nothing beats starting your day off with a hot cup on hand. You’ll find a traditional glass pot drip maker in almost every home and office around the world. However, when it comes to keeping your favorite morning beverage hot, a traditional glass pot is simply not that effective. Enter the insulated thermal carafe. These thermos-esque containers can help keep your coffee hot up to three times longer than a normal glass pot. This makes them a must-have product for people like me who tend to come back for seconds and thirds, or for offices and other environments where large batches of coffee are made to serve a number of people throughout the day. In this article we’ll go over our 5 favorite (highly rated and highly recommended) thermal coffee carafes. But before our picks, we’ll discuss some key factors regarding what to look for when purchasing so that you can make an well-informed decision as a smart consumer. Let’s get to it! As a quick note, you do have the option to choose between fancy glass carafes and the thermal options we’ll focus on in this article. If you’re not set on opting for an insulated model, let me briefly convince you why you should. In short, thermal carafes definitely offer more convenient and beneficial performance than your traditional glass container. Why? Simple, really: The thermal carafe manages to retain the content’s temperature significantly longer than glass types can. In an office scenario, for example, the thermal carafe is a much more practical choice – you can expect several people to make multiple trips to the coffee maker throughout the day. If you keep the brew in a normal glass pot, it’ll eventually go cold and the next person to hopefully come along will throw it out and brew a new batch. This takes more time, and also just wastes lots of perfectly good coffee for no reason. Now, let us look at the key factors you should consider before purchasing a thermal carafe. Choosing the right carafe is simpler than it seems.Take these factors into mind when shopping for a thermal carafe to make sure you end up with the possible choice. This depends on whether your thermal coffee carafe will be for home use or for a larger-scale setting. If you will be using this for your home then smaller ones should suffice. Something around the 32-ounce range is a good choice for personal/home use. If this will be used in an office setting then go for larger sizes – 68-ounces is a good number, and will yield 8 to 9 standard 8oz cups of coffee. Make sure your thermal carafe can retain the temperature of the beverage inside for as long as possible. A good quality model can keep hot coffee toasty for as long as 12 hours. On the flip side, your cold drink should also maintain its icy cold temperature for at least 4 to 6 hours. Certain models come with a slew of helpful and nifty new features to help improve ease of use and convenience. Check if there are any special features to see if the model offers anything that might make your experience of using it better and easier. Easy-pour spots, easy-clean options, included cleaning supplies, and so on are all “ease of use” perks I’ve seen included with certain models. Not all thermal carafes follow the same look and size. Some are taller and sleeker while others have a bulkier appearance. Sleeker models could even be placed in your car’s cup holder and be brought during road trips, for example. Larger carafes, on the other hand, offer more storage capacity and more stability/balance for high traffic, high capacity areas like offices. While probably on the back burner of essential factors when it comes to choosing thermal carafes, the aesthetic should not be ignored. Your thermal carafe will most likely get used during special occasions. Obviously, you don’t want something that would look out of place in the general aesthetic of the celebration, right? Go for a thermal carafe that fits your personal style or something that is compatible with almost all types of aesthetics. While you might be tempted to go for dishwasher safe models, keep in mind that thermal carafes with hand-wash options are sometimes the ones with the most eye-catching design. A little work when it comes to cleaning is a small price to pay to have a beautiful looking thermal carafe, right? Vacuum seal technology and double-wall lining insulation. 18/8 stainless steel construction for impressive durability. Comes with a 1-year guarantee return policy. Plastic parts do feel a bit cheap. Pumping mechanism might slow down the dispensing process inadvertently. The 3-liter capacity might make you wonder if this can retain the temperature of the beverage properly, the question to that is a resounding yes. Cresimo utilizes vacuum technology when it comes to sealing the contents. This ensures your beverage maintains its temperature for at least 12 hours without any problem. The design of the Cresimo 3L Airpot Thermal Carafe features the large mouth opening that makes refilling and cleaning quick and easy. The lever is also designed to be operated easily with one hand, this means you can start pouring onto your cup without the need to put down whatever food you are eating with your other hand. Simple, convenient, and tough. The extra-wide opening makes refilling and cleaning quite easy. The affordable price tag for the quality it manages to deliver. Cold beverages can retain its temperature for almost 24 hours. Comes with a pot cleaning brush. The handle can occasionally become a bit hot to the touch. You need to follow the heat retention instructions to the letter if you want it to keep your hot beverage hot for a prolonged period of time. The exterior of the carafe is susceptible to dust stains. The Pykal is a German-engineered thermal coffee carafe which should give you an idea of the quality you are in for. This is a surgical-grade stainless steel thermal carafe made to last. It features vacuum insulation seal which guarantees that whatever you pour into it remains hot or cold without actually affecting the exterior’s temperature. Pykal Thermal Carafe manages to retain the content’s temperature for as long as 24 hours with only little changes which are quite impressive. It also features Pykal’s signature ‘press button’ technology which improves its overall convenience and reliability. The ‘press button’ feature keeps everything sealed with no leaks and spills. 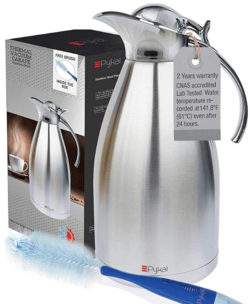 Pykal offers the 2L thermal coffee carafe with a 2-year warranty which shows the manufacturer’s utmost confidence in their product. Press button technology allows for easy single-handed use. Comes with a free pot cleaning brush. Rubberized handle for better grip. You will need to follow the heat retention instructions for optimal results. The exterior is susceptible to dust stains. 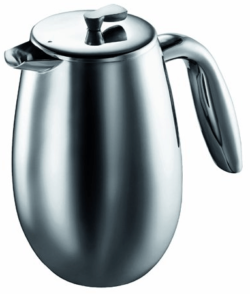 Another Pykal thermal carafe makes it into the list, this time it is their Premium Stainless-Steel Carafe model. 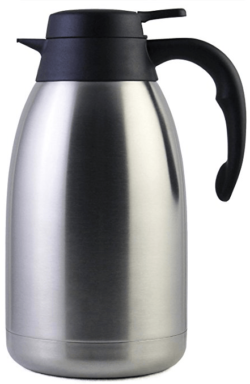 Similar to the previous Pykal entry, this model utilizes a vacuum insulated seal to ensure the beverage stays hot or cold for a long period of time inside the thermal carafe. It features double-wall insulation technology to ensure that the temperature only stays in the exterior and will not affect the exterior casing. Unlike the previous Pykal carafe we reviewed, this version uses a non-slip rubber handle which helps improve grip and reduce the risk of it slipping from your hands. It features a similar locking vacuum seal mechanism to all Pykal thermal carafes. Again, this thermal carafe utilizes the patented ‘press button’ technology by Pykal which prevents leakages from happening. It can easily carry 2 liters of beverage and is built to last for years. The extra-wide opening also makes cleaning and pouring in your drink easy. The overall design also manages to retain the Pykal signature sleek and elegant aesthetics. 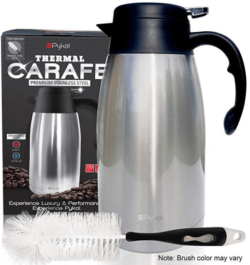 This thermal carafe from Pykal also comes with a 1-year warranty for their customers who buy this directly from them. Extra wide opening for quick and easy refills and cleaning. Designed to maintain temperature for 12 hours (hot) and 24 hours (cold). You need to take extra care of the lid as its vacuum seal will be completely compromised if damaged. Cresimo makes its second appearance in this list with its 2L Stainless Steel Thermal Coffee Carafe. This is a wider variant to the 3L Cresimo Carafe from earlier. As expected, the 2L Stainless Steel manages to seal in the temperature without any problems. We clocked the temperature of the beverage we poured in to remain the same for at least 12 hours. If you plan on pouring cold drinks then expect it to retain its cool temperature for close to 24 hours. This is made possible thanks to its double-wall interior lining that keeps the temperature within the same for a prolonged period of time while keeping the exterior casing’s temperature normal. It also uses the 18/8 stainless-steel construction making it one of the more durable thermal carafes in the market today. The thermal carafe from Cresimo also features the single-handed pouring feature that is synonymous with the manufacturer’s ‘push button’ technology. Impressive heat and cold retention. Utilizes more plastic parts than similar models. While slightly more expensive than the rest of the entries in this list, the Bodum justifies this with its stylish stainless-steel design. In terms of quality, the Bodum Columbia definitely earns its spot as among the top thermal coffee carafes in the market. Similar to other top-rated carafes, the Bodum Columbia utilizes the double-walled insulation design which helps keep the temperature inside the coffee pot for as long as possible. The insulation of the Bodum Columbia also helps keep cold beverages chilled for a long period of time. One important feature of the Bodum Columbia is the stainless-steel plunger and ease of cleaning. This little addition helps in making some rich tasting coffee while also being exceptionally easy to clean. The Bodum Columbia is also perfectly dishwasher safe. The Bodum Columbia Thermal Coffee Carafe is worth the extra bucks with its impressive construction and insulation capability. Every coffee lover needs a reliable thermal coffee carafe. Hopefully, this list has shed some light on how you can choose the best one. You can use the top 5 list above to help keep your choices narrowed. Remember the guidelines we’ve gone over and it will be virtually impossible to land on the wrong carafe for all your coffee drinking needs.